Applications are invited from qualified Scheduled Tribe candidates of Kerala State for selection to the following post. Applications must be submitted online through the official website of the Commission after One Time Registration. Candidates who have already registered can apply through their profile. The photo uploaded through One Time Registration should be the one taken after 31.12.2010 and also bear the name of candidate and the date of photo taken should be recorded in the bottom of the photograph. The uploaded photo will be having a validity of ten years from the date of photograph taken. 4 No. of vacancy : 1 (One)Note: The above Vacancy is now in existence. The Ranked list of selected candidates published by the Commission shall remain in force for a minimum period of one year and a maximum period of three years provided that the said list will not continue to be in force if a new list after the expiry of the minimum period of one year is published. Recruitment will be made for the above vacancy and also for the vacancies reported for Special Recruitment from Scheduled Tribe only during the currency of the list. 6 Age : 22 ­ 45 . Only Candidates born between 02.01.1970 and 01.01.1993 (both dates included) are eligible to apply for this post. No other age relaxation will be allowed. 1) Degree of Master of Law with at least 50% marks. 2) Experience at the Bar for a period not less than three years. 3) Must have passed a comprehensive test specifically conducted for the purpose by UGC or any agency duly constituted by the State government in this behalf. Note: (1) Candidates who have obtained Ph.D degree in the concerned subject or have passed M.Phil in the concerned subject by 31.12.1993 are exempted from passing NET examination. (2) For recruitment to this post degree awarded by the Universities recognized by UGC alone shall be considered. (3) Rule 10(1)(ii) of Part II KS&SSR is applicable for this selection. 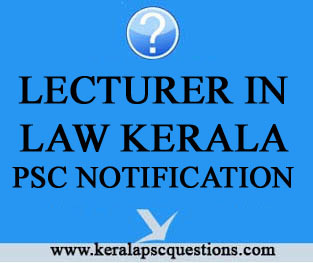 Candidates must register as per 'One Time Registration' with the official website of Kerala Public Service Commission www.keralapsc.gov.in before applying for the post. Candidates who have already registered can apply by logging on to their profile using their User­ ID and password. Candidates must click on the 'Apply Now' button of the respective posts in the Notification Link while applying for a post. No application fee is required. Candidates can view and have a printout of the details in the profile by clicking the link Registeration Card. Candidates are responsible for the correctness of the personal information and secrecy of password. Before the final submission of each application, the candidates must ensure correctness of the information on their profile. They must quote the User­ID for further communication with the Commission. Application submitted is provisional and cannot be deleted or altered after submission. The application will be summarily rejected if noncompliance with the notification is found in due course of processing. Documents to prove qualification, experience, community, age etc. have to be produced as and when called for. 9 Last Date for receipt of applications : 03.02.2016 Wednesday up to 12 Midnight. 11 Paragraphs two, three and twenty five (except the conditions laid down in the Rule 3 (C) of Part II of the kerala State and Subordinate Service Rules) are not applicable to this selection. 12 Appointment are made on the basis of the rank secured in the ranked list of candidates prepared in pursuance of this notification subject to the conditions laid down in G.O. (P) No. 21/76/PD dated, 17.01.1976 and G.O. (P) No.25/94/GAD dated, 22.01.1994 allowing special reservations to Scheduled Tribes in accordance with the procedures made for this purpose from time to time and subject to the rules under sections 3(c), 17(a), 17(b) of Part II of Kerala State and Subordinate Service Rules, 1958. 13 If a written Test/OMR Test is conducted as part of the selection, Admission Ticket of eligible candidates will be made available in the website of Kerala Public Service Commission. Candidates are instructed to download their Admission Ticket as per the instructions in the Website. (For details including photo and ID card etc. refer to the General Conditions at the end of the notification).